Buying a home is one of the biggest moments in people’s lives. In fact, it’s probably the biggest purchase consumers make. Buying a new home also comes with its share of symbolism and emotion. It represents hope for the future, economic stability and status, as well as the place one will call home for oneself and one’s family for the foreseeable future. Given how much is invested in buying a new home, there are fewer moments that are as important as the real-estate closing day. That’s when a new home purchase becomes official, and all of one’s hopes and dreams about the new place, and perhaps even a new life, start. However, as important as closing day is in making the important event official, there are procedures to keep in mind to ensure that all things go smoothly. The last thing anyone wants is for something to go wrong on closing day, or to have the big dream of buying a new home hit an unforeseeable snag. Probably the most important event on closing day, from a both an emotional and physical standpoint, is the passing off of the keys from seller to buyer. However, this process of handing over the keys is actually part of a contractual obligation between the two parties in a real-estate transaction. Some people wonder why they can’t move in early if the home seller has already moved out. The reality is that the keys can only be delivered if all the other terms of the contract have been met, including the transfer of funds as well as the registration of the purchase. Until these contractual obligations are met, the purchaser’s real-estate lawyer would have to hang onto the keys in escrow. Once everything is completed, then the keys can be handed over to the home buyers, and the sale is completed. In general, keys are often given to a home buyer some time in the afternoon on closing day. 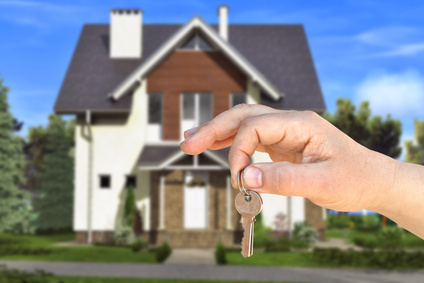 The purchaser’s real-estate lawyer can arrange for the formal handing over of the keys. Alternatively, some new-home builders have packages prepared for new-home buyers, which includes the picking up of the keys at the builder’s sales office.